The new Arnold & Son Globetrotter features a 45 mm case in stainless steel case and held by a large central arched bridge spanning the entire diameter of the dial, the A&S Globetrotter’s three-dimensional worldtime display takes the center stage. At 45 mm wide and 17.23 mm at its highest point, the Globetrotter features one of the world’s largest rotating 3D world-time displays on a wristwatch. Depicting a view of the Earth’s Northern Hemisphere as seen from space as if directly above the North Pole the Globetrotter’s representation of our planet is exquisitely detailed. Starting with a rounded piece of brass, the different textures of the oceans and continents are brought out by chemical etching with a mask, followed by polishing the upper surfaces. The mountainous areas are then sandblasted to create a sense of visual depth, then the oceans are lacquered by hand with different blue tones. The entire world-time disk is then treated with a layer of clear lacquer, and finally the entire component is polished. The result is a hemispherical disk full of lifelike details. Seemingly floating above a silvery-white opaline dial with Roman numerals for the hour hand and a circular brushed chapter ring for the minutes, the world-time display is surrounded by a 24-hour sapphire disk fixed to the same bridge that hold the hemisphere, transparent between 06:00 and 18:00 and with a translucent metallic treatment from 18:00 to 06:00, serving as a day and night indicator. The world-time makes one complete rotation every 24 hours. Intuitive to read and adjust, the Globetrotter features a three-position crown system. The first position is used to manually wind the movement, the second position sets the local time —hour hand— in one-hour increments, and the final position is used to set the hour and minute hands and the world-time. Both the main time display as well as the world-time function can be adjusted forwards and backwards. To keep the focus of the dial on the world-time display, the hour and minute hands, in blued steel are placed under the hemisphere, as if circling in its periphery. To enhance legibility, the hands are filled with red lacquer. The Globetrotter is housed in a stainless steel case measuring 45 mm in diameter, with a thickness of 17.2 mm including the domed sapphire “glass box” crystal, and 10.4 mm without the crystal. Entirely developed and manufactured by Arnold & Son, the Globetrotter’s A&S6022 features an automatic winding system by means of a central, rotor, engraved with a hobnail motif with a black ADLC treatment. When fully wound, the 29-jewel movement provides a power reserve of 45 hours. The NAC grey treated movement features Haute Horlogerie finishing with hand-chamfered and satin-finished lever and bridges, polished edges and fine circular graining and Côtes de Genève stripes radiating from the center. 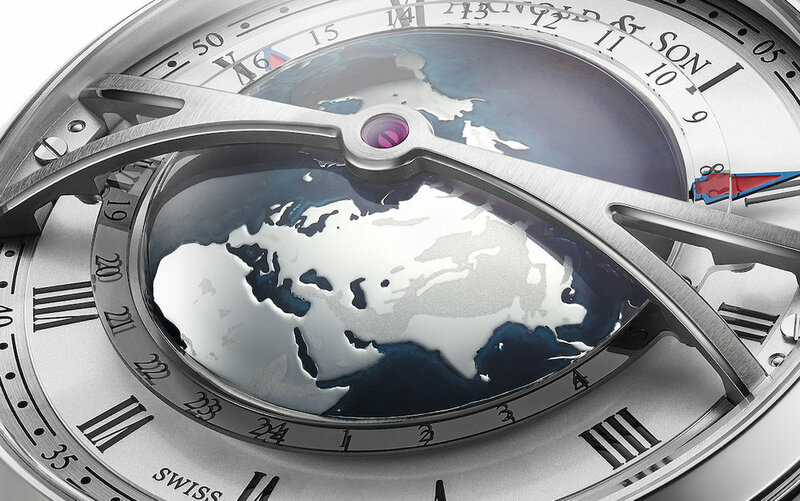 With the Globetrotter, Arnold & Son masterfully demonstrates its unique aesthetic sense and manufacturing prowess, combining ingenious haute horlogerie with artisanal crafts to produce a world-time watch that is truly unlike any other. Live pictures to follow next week as we report live straight from Baselworld 2018 in Basel, Switzerland. Sticker Price $16,995 USD. For more info on Arnold & Son click here.